Exposure to solar ultraviolet (UV) radiation is known to have both adverse and beneficial consequences for human health. Sunburn and skin cancer are probably the most well-known acute and chronic adverse health impacts. These themes have recently been discussed in the media for the general public; consequently interest in sun protection is growing. The promotion of the use of practical personal strategies to reduce adverse health risks, such as healthy sun behaviour, sun protection mechanisms and solar ultraviolet radiation awareness tools, is increasing. 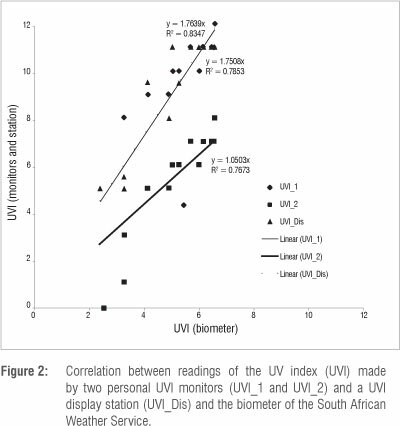 One such tool is the personal UV index (UVI) monitor, promoted commercially as a viable tool for sun awareness; however, such instruments have not been scientifically evaluated in a South African context. 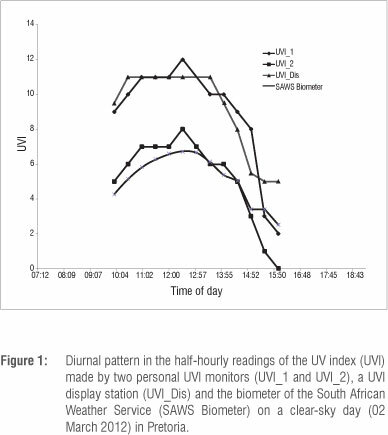 Here, two different types of personal UVI monitors, commercially available in South Africa, were compared with a research-grade UVB biometer for a continuous 7-h period on 02 March 2012 in Pretoria. One of the two personal UVI monitors showed reasonable agreement with the UVB biometer, whereas the other monitor overestimated UVI by up to 4 UVI units. When comparing two identical products manufactured by the same company, one monitor overestimated UVI twofold, suggesting inter-instrument variability may be a concern. Commercially available, personal UVI monitors should be used with caution as a public health tool for sun awareness in South Africa. Several tools, practices and strategies have been developed to educate the public about the harmful effects of solar UV radiation exposure, especially sunburn. Such education may focus on disease prevention, early detection and treatment and raising awareness about the solar UV radiation environment and healthy sun behaviour. The World Health Organization INTERSUN programme provides guidance about effective sun awareness programmes and encourages countries to reduce UV-induced health risks through coordinated efforts.7 The US SunWise programme is one such example of an environmental and health education programme that aims to teach children and their caregivers how to protect themselves from overexposure to the sun. Non-scientific, personal UVI monitors are commercially available in South Africa. These include, among others, watches, weather stations, purpose-built UVI display stations and portable dosimeters. 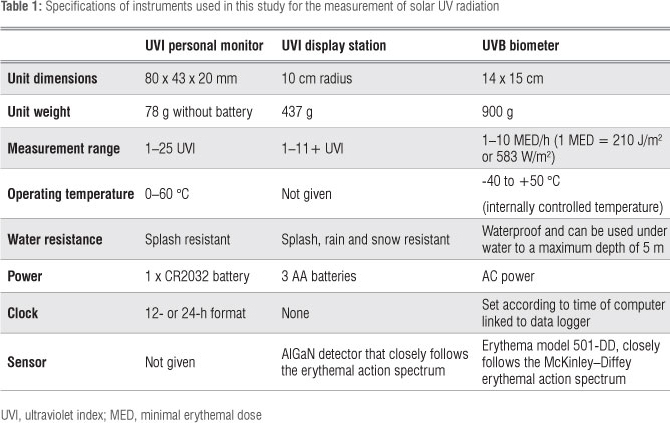 Previous research has shown significant discrepancies between commercial and scientific solar UV radiation measuring instruments.10 Here, preliminary research was carried out to compare personal UVI instruments that are commercially available in South Africa with a research-grade UV biometer to determine the trustworthiness of the commercial products as sun awareness tools. Several retail outlet stores were searched for personal UVI instruments. The purchased instruments were chosen because they were reasonably priced, readily available and easy to operate. Two types of instruments were employed for physical solar UV radiation measurements. Two inexpensive, personal UVI monitors (identical monitors, same brand, name withheld) were purchased from a South African retail store. A reasonably priced uVi display station was bought from an online company (name withheld) that readily ships products to South Africa. These two commercially available products were calibrated against a research-grade Solar Light 501 UVB biometer located at the South African Weather Service (SAWS) in Pretoria (25°48'34.12" S; 28°15'22.34" E). SAWS maintains a routine programme for monitoring erythemally weighted, solar UVB radiation at Cape Town, Cape Point, Durban, Pretoria, Port Elizabeth and De Aar. The main purpose of the solar UVB biometer network is to create public awareness and to provide real-time information regarding the hazard of excess exposure to biologically active solar UVB radiation. Calibration took place on a mostly clear-sky day, i.e. some light cumulus cloud appeared during the day but never obstructed the solar disk (date of calibration was 02 March 2012). Full specifications of the instruments are given in Table 1. All instruments were situated in a non-shaded area on a horizontal and level plane within half a metre of each other on the roof of the SAWS building. Measurements were recorded half-hourly from 10:00 to 16:00, manually for the personal UVI monitors and UVI display station and by the data logger of the biometer. The biometer measurements were recorded in minimal erythemal dose (MED) units (1 MED = 210 J/m2). These units were later converted to half-hourly UVI values by dividing the MED value by 1800 for the number of seconds in half an hour and then multiplying by 40, the standard coefficient for calculating UVI.14 Thus the measurements of all three instruments were compared in UVI. The personal UVI monitors (two monitors, same brand) were also compared with each other over 18 days (10-27 May 2011); measurements were not taken on some days because of cloud cover). UVI readings were taken manually on the hour as often as possible between 09:00 and 16:00. The monitors were pointed towards the sun, as recommended by the manufacturer, and were set to measure the UVI within 15 s of each other. Linear regression was applied to the two sets of UVI measurements to ascertain inter-instrument variability. Figure 1 shows the half-hourly UVI readings made by the two personal UVI monitors (UVI_1 and UVI_2), the UVI display station and the SAWS biometer. The SAWS biometer UVi readings show the typical convex curve with UVI increasing towards midday and decreasing towards sunset. erythemally weighted, solar UVB radiation at Cape Town, Cape Point, Durban, Pretoria, Port Elizabeth and De Aar. The main purpose of the solar UVB biometer network is to create public awareness and to provide real-time information regarding the hazard of excess exposure to biologically active solar UVB radiation. Calibration took place on a mostly clear-sky day, i.e. some light cumulus cloud appeared during the day but never obstructed the solar disk (date of calibration was 02 March 2012). Full specifications of the instruments are given in Table 1. Measurements from UVI_2 agreed most closely with those of the SAWS biometer, with a linear fit of y = 1.0503x and an R2 = 0.7673 (Figure 2). The measurements of UVI_1 and the UVI display station did not agree as closely with the SAWS biometer data, with linear fits of y = 1.7508x (R2 = 0.7853) and y = 1.7639x (R2 = 0.8347), respectively (Figure 2). These results indicate that UVI_1 and the UVI display station overestimated solar UV radiation by an average of 3.8 and 4.0 UVI, respectively. 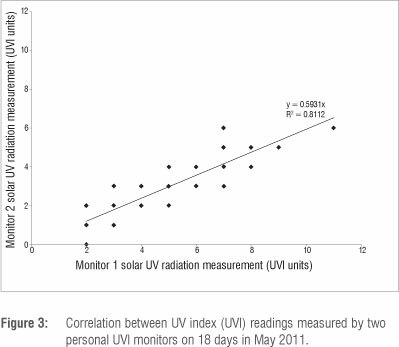 From a personal use and public health perspective, overestimation of UVI by a personal monitor is less worrying than underestimation of UVI, which may lead to excess sun exposure when the individual assumes that UVI levels are lower than they are in reality. However, as shown in Figure 3, UVI_1 overestimated UVI by approximately twofold compared to UVI_2, despite being identical products made by the same company. Therefore, instrument inconsistency remains a concern. Only one of the personal UVI monitors accurately measured the correct UVI reading as measured by a research-grade instrument. A similar finding was made by de Paula Corrêa et al.10 in their study comparing UVI measurements performed by research-grade and consumer-product instruments. They found most consumer-product instruments showed large discrepancies in UVI measurements compared to spectrometer data. It is important to note that comparison of research-grade and commercially available UVI instruments entails comparing two different but related quantities: the horizontal hemispheric solar UV radiation incident on the UV biometer versus the limited solid angle solar UV radiation incident on the personal UVI monitors.10 One would expect some differences, naturally occurring, between UVI measurements made by the personal UVI monitors and the UV biometer, but differences larger than 50% suggest reason for concern. Overestimation of UVI levels is less of a public health concern than underestimation of UVI levels. Additional research in the form of a full research study should be carried out to verify these preliminary results among as many commercially available personal UVI monitors as possible. An alternative to the use of personal UVI monitors is a forecast of the daily midday UVI values. However, this practice is contested as a public health tool9 because the predicted UVI midday maximum may not usually change for several days or weeks during summer, unless cloud cover is included in the algorithm. Broadcasting companies are reluctant to report the same UVI value daily for long periods14,15 and even if the public understand what the UVI means, hearing the same UVI value given daily may lead to a non-behavioural response. Another alternative may be to always include cloud cover in UVI forecasting calculations and to give mid-morning, midday and mid-afternoon UVI values to the public to show diurnal change in UVI levels and also to indicate suitable periods for outdoor activities. To date, no study has been undertaken in South Africa to ascertain whether the public understands what the UVI describes and how sun protection options may be linked with UVI values. For South Africans knowledgeable about the risks of excess sun exposure and who want to protect themselves by using commercially available UVI monitors, there is a risk that the products they acquire are not reliable or trustworthy. Hence, it is important to perform additional research analyses to assess a larger set of commercial UVI instruments during different seasons and at different altitudes, among other factors, in South Africa. We wish to acknowledge G. Coetzee and K. Ncongwane for provision of SAWS data, CANSA for relevant information, the CSIR for funding, N. Phala for data preparation and M. Norval and R. Garland for helpful discussion. C.Y.W. conceptualised the project, performed some of the experiments and drafted the manuscript. P.N.A. performed some of the experiments and assisted in writing the manuscript.